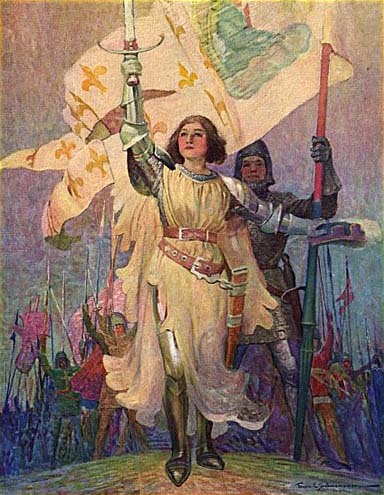 Originally published in 1919 this historical novel about Joan of Arc by Lucy Foster Madison does a good job of presenting the established history of Joan of Arc in an entertaining and easy to read manner. Originally written with a younger audience in mind this novel is a good choice for older children however adults may also enjoy this book. Contains eight beautiful illustrations by famed American artist Frank E Schoonover. In presenting this story for the young the writer has endeavored to give a vivid and accurate life of Jeanne D’Arc (Joan of Arc) as simply told as possible. There has been no pretence toward keeping to the speech of the Fifteenth Century, which is too archaic to be rendered literally for young readers, although for the most part the words of the Maid have been given verbatim. The name of this wonderful girl has been variously written. In the Fifteenth Century the name of the beloved disciple was preferred for children above all others; so we find numerous Jeans and Jeannes. To render these holy names more in keeping with the helplessness of little ones the diminutive forms of Jeannot and Jeannette were given them. So this girl was named Jeannette, or Jehannette in the old spelling, and so she was called in her native village. By her own account this was changed to Jeanne when she came into France. The English translation of Jeanne D’Arc is Joan of Arc; more properly it should be Joanna. Because it seems more beautiful to her than the others the writer has retained the name of Jeanne in her narrative. It is a mooted question which form of the name of Jeanne’s father is correct: D’Arc or Darc. It is the writer’s belief that D’Arc was the original writing, when it would follow that Jacques D’Arc would be James of the Bow or James Bowman, as he would have been called had he been an English peasant. For this reason the Maid’s surname has been given as D’Arc; though there are many who claim that Darc is the nearest the truth. Acknowledgments are due to the following authorities into the fruit of whose labours the writer has entered: M. Jules Quicherat, “Condamnation et Réhabilitation de Jeanne d’Arc”; H. A. Wallon, “Jeanne d’Arc”; M. Siméon Luce, “Jeanne d’Arc Domremy”; M. Anatole France, “Jeanne d’Arc”; Jules Michelet, “Jeanne d’Arc”; Monstrelet’s “Chronicles”; Andrew Lang, “The Maid of France”; Lord Ronald Gower, “Joan of Arc”; F. C. Lowell, “Joan of Arc”; Mark Twain, “Joan of Arc”; Mrs. Oliphant, “Jeanne D’Arc”; Mrs. M. R. Bangs, “Jeanne D’Arc”; Janet Tuckey, “Joan of Arc, the Maid,” and many others. The thanks of the writer are also due to the librarians of New York City, Albany and Glens Falls who kindly aided her in obtaining books and information. Thanks are also due to the Rev. Matthew Fortier, S. J., Dean of Fordham University, New York City, for information upon a point for which search had been vainly made.